Additional price information for campers, caravans, large cars, busses, bikes, boats, trailers and other transport possibilitie, please consult the webiste of Jadrolinija www.jadrolinija.hr as we do not have all the information in our listings. Size, amount of persons and time of the year will influence the sales price of your tickets. After every flight arrival of every flight company a Croatia Airlines bus will be waiting outside the airport, 50 meters to the right when exiting the building. The bus takes you straight to the ferry port for 5 euro (35 Kuna). You can buy the ticket after you take your seat and you can pay in Euro or local currency. 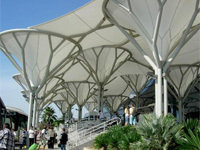 The bus stops directly behind the ticket kiosk at the ferry port where you can buy your ferry or Catamaran ticket to Vela Luka. If you have some time before your ferry or Catamaran leaves you can store your luggage in the luggage depot for a small fee. It is safe as this service is run by the government. 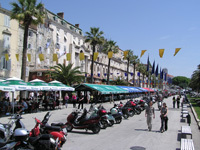 Split town and the hug market is 2 minutes from the ferry port so you can shop around, have something to, get a sun-tan on one of the benches with sea-views on the Riva (promenade), visit the market or drink something in one of the many terraces on the seafront. When coming from the A1 highway, exit the highway at Dugopolje (toll) and follow the road directions toward Split / Dubrovnik (E65). 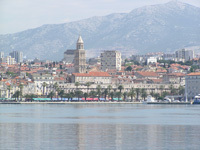 As you get closer to Split you will see a road sign – 'Split center'. Take that off-ramp. Down at the bottom, at the stoplights, go straight. Then after about 100 / 150 meters take a right at the junction. (Be aware that traffic coming from the left has right-of-way and they often drive fast). Just follow the road (middle lane is the best choice) all the way down to the ferry port (you pass quite a few stoplights). When you finally get to the ferry port you will see a market on your right-hand-side and the road itself turns / bends to the left toward the sea. Exactly in that bend is a small kiosk / ticket office and you can park in front of that office for a few minutes to buy tickets to Vela Luka. If it is not possible to park there then follow the road along the sea and in the middle of the harbour on the sea-side you will see a big building with a terrace and a supermarket in front of it. This is the main ticket office (behind the supermarket) and you can also buy your tickets there. Next to the supermarket you can also see a big digital announcement board with the ferry lines, destinations, dock numbers and departure times. Look for Vela Luka / Ubli (Lastovo) and when you know the dock number (normally one of the last two docks’ of the port nr 26 or 27) you can simply park your car in the correct lane / dock and then buy your tickets. The Toll fees can be paid with any currency including the Euro. There are many fuel stations on the highways with toilet and coffee facilities but if you go off the highway there are not that many fuel stations so we advise you fill up your tank regularly and start looking for a fuel station when your tank gets half full. Fuel stations only accept local currency so not the Euro (and of course credit cards - visa, mastercard etc). When paying by credit card anywhere please have a pin code available otherwise credit card payments can not be accepted in Croatia. We advise you not to change money in the local tourist offices / exchange bureaus as the banks have the best & non-commission rates. ATMs can be found just about everywhere!